On Thursday, February 28, 2013 at 8pm join KCRW, Writers Bloc, and The Hollywood Reporter for an evening of conversation with Kim Masters and Pulitzer Prize-winning author, screenwriter and playwright Lawrence Wright. Kim Masters, KCRW’s host of The Business, will sit down with Wright to discuss his latest book, Going Clear: Scientology, Hollywood and the Prison of Belief. At New Roads School’s Ann and Jerry Moss Theater, 3131 Olympic Blvd., Santa Monica, CA 90404. This will be a candid conversation about the inner workings of Scientology, its charismatic founder L. Ron Hubbard, and why so many in Hollywood are drawn to the church. To gain understanding and insight Wright conducted extensive interviews with former Church leaders, some of whom have just now been speaking publicly for the first time. The conversation will be followed by a Q&A and book signing. The evening will take place at New Roads School’s Ann and Jerry Moss Theater: a brand new, state of the art theatre located on the New Roads campus in Santa Monica, 3131 Olympic Blvd. Santa Monica, CA 90404. Limited parking is available in the New Roads parking lot, located between Olympic Blvd. and Nebraska; limited street parking is also available. Please make sure to read signs carefully as much of the nearby areas are restricted. 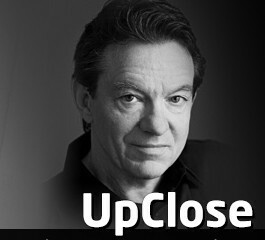 KCRW’s UpClose event series features KCRW on-air personalities in lively and compelling conversations with some of the leading figures in film, art, politics, literature and pop-culture. Created in 2010, each UpClose event takes place before a live audience. Lawrence Wright is an author, screenwriter, playwright, and a staff writer for The New Yorker magazine. His history of al-Qaeda, The Looming Tower: Al-Qaeda and the Road to 9/11 (Knopf, 2006) was published to immediate and widespread acclaim, spending eight weeks on The New York Times bestseller list and being translated into twenty-five languages. It was nominated for multiple awards, awarded the Pulitzer Prize for General Nonfiction, and was pronounced “one of the 100 best nonfiction books ever written” by Time Magazine. Wright is a member of the Council on Foreign Relations. He also serves as the keyboard player in the Austin-based blues band, Who Do. Kim Masters is Editor-at-Large of the The Hollywood Reporter and host of KCRW’s The Business – the show that brings you the who, how and what of the entertainment industry. In 2012, The Business won the Gracie Award for Outstanding Talk Show in the Entertainment/Information category for Public Radio. In 2011, Masters won Entertainment Journalist of the Year from the L.A. Press Club for her work on The Business and The Hollywood Reporter. Kim Masters is the author of The Keys to the Kingdom: The Rise of Michael Eisner and the Fall of Everybody Else and co-author, with Nancy Griffin, of Hit & Run: How Jon Peters and Peter Guber Took Sony for a Ride in Hollywood. KCRW 89.9FM is an NPR affiliate serving Southern California and licensed to Santa Monica College. The public radio station represents cutting edge radio at its best, presenting an eclectic mix of independent music, news, talk and arts programming. KCRW’s programming is internationally renowned and available worldwide at KCRW.com. KCRW offers an all-music channel, Eclectic24, an all news channel and on-air simulcast. Podcasts and archives of our locally-produced programs and live band performances are available on our website, as well as on our smartphone apps for the iPhone, Android and Blackberry. Writers Bloc Presents is a nonprofit literary series now in its 17th season. Writers Bloc brings to Los Angeles their favorite writers, artists and social critics who have made a significant impact on our cultural landscape to hear them talk about their ideas with other writers, artists and personalities. The Hollywood Reporter is the definitive interpretive voice of the entertainment industry. Informing, engaging and empowering content is delivered across a multimedia platform that includes: a weekly magazine, bi-monthly special reports, quarterly glossies, a Website, a daily news PDF, iPad app and events. The Hollywood Reporter is read by the most powerful people in the entertainment industry and the most influential consumers who follow it – those who shape desire, set trends and ultimately drive culture – providing an unmatched level of access and influence. Tickets go on sale Monday, January 28, 2013 @ 10am. Tickets are limited & available on a first-come, first-served basis. Please email events@kcrw.org or contact KCRW Membership at 310-314-4635 between the hours of 10am & 5pm, Monday – Friday.